You may have been aware that today was Super Tuesday. And perhaps you're already making the most of Mardi Gras. But did you know that February 5 is also International Pancake Day? So those of you disinterested in the political process or put off by Fat Tuesday's revelry have something of your own to celebrate. 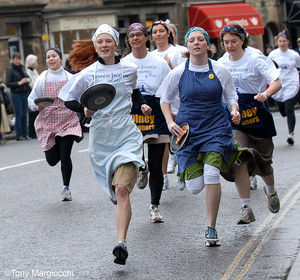 This year's International Pancake Race, is held today (at 11:55 a.m.) is the 59th annual race between the women of Olney, England, and Liberal, Kansas. In both of the cities, the women wear a traditional apron and run a 415-yard S-shaped course flipping a pancake on a skillet (naturally – how else would you carry a pancake?). 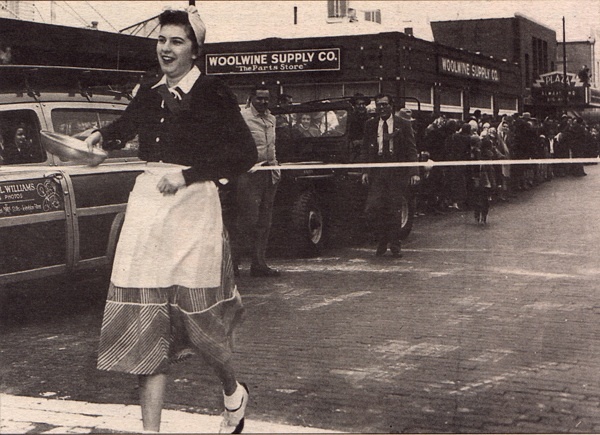 In 1950, a picture of the women racing appeared in an American magazine, drawing the attention of Liberal Jaycee President R.J. Leete. He contacted the Rev. Ronald Collins, Vicar of St. Peter and St. Paul's church in Olney, challenging their women to race against women of Liberal, and the race has been run ever since. The kiss is still the traditional prize in both races. Can't make it to the race? Next time you're in Liberal, Kansas, stop by the free International Pancake Day Hall of Fame, open on Fridays, Saturdays, and Mondays. Between the cities of Dunedin and Oamaru on New Zealand's South Island is Moeraki, a small coastal town home to famous rock formations. 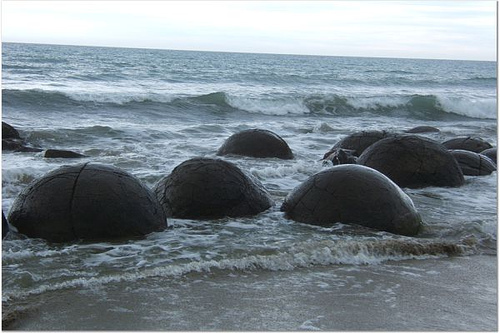 According to Maori legend, the Moeraki Boulders are gourds that washed ashore (on what is now Koekohe Beach) when the Araiteuru canoe was wrecked hundreds of years ago. But every myth has a scientific explanation: The boulders are calcite concretions, formed over 60 million years ago in seafloor sediment. The spherical boulders formed in a pearl-like process that took as long as four million years (due to crystallization of calcium and carbonates), and the soft mud that contained the boulders surfaced due to wind and rain. The boulders vary in size—up to ten feet (three meters) in diameter—and can weigh several tons each. Kiwis love their fences. And even more, they love decorating fences with unwanted articles of clothing. The most interesting fence is the Cardrona Bra Fence, which has been a controversial tourist attraction in the Central Otago district on New Zealand's South Island since 1999. Until recently, hundreds of bras lined this fence near Wanaka, a resort town. "The original reason for the bras being attached to the fence is unknown," said Londoner Michelle Adams, who took this photograph. "News spread of the addition, which was left on the fence by the local landowners, and more bras began to appear. The fence was on a public reserve road adjacent to farm property in the Cardrona Valley area southwest of Wanaka. The local council determined the bra fence was a 'traffic hazard' and early in 2006 they removed over 200 bras. In September 2006 they removed the rest - over 1500!" Where in the world have you seen strange object-lined fences? Let us know in the comments below. It's a modern Leaning Tower of Pisa -- only, wait, it's supposed to do that. The next time you're in Prague, be sure to visit The Dancing House (the Tančící dům, completed in 1996), located on the corner of Rasinovo nabrezi and Resslova street, along the River Vltava near the city center. The contemporary building, designed by architects Vlado Milunc and Frank O. Gehry (surprised?) is home to offices and French restaurant La Perle de Prague, which offers stunning views of the River Vltava, Prague Castle, and St. Vitus's Cathedral. 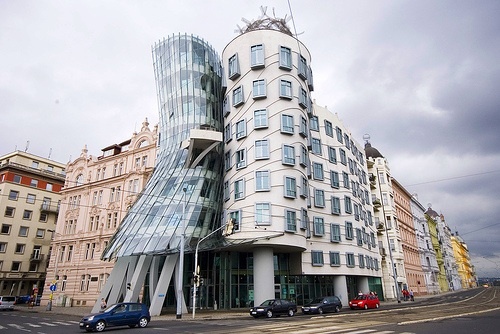 Fondly referred to as the "Ginger and Fred" building (aptly named for the famous dancing duo), the Dancing House is an example of deconstructivist architecture and (for the imaginative) resembles two people dancing. To get there, take the metro's yellow line B to Karlovo Namesti station. Can’t make it to England? 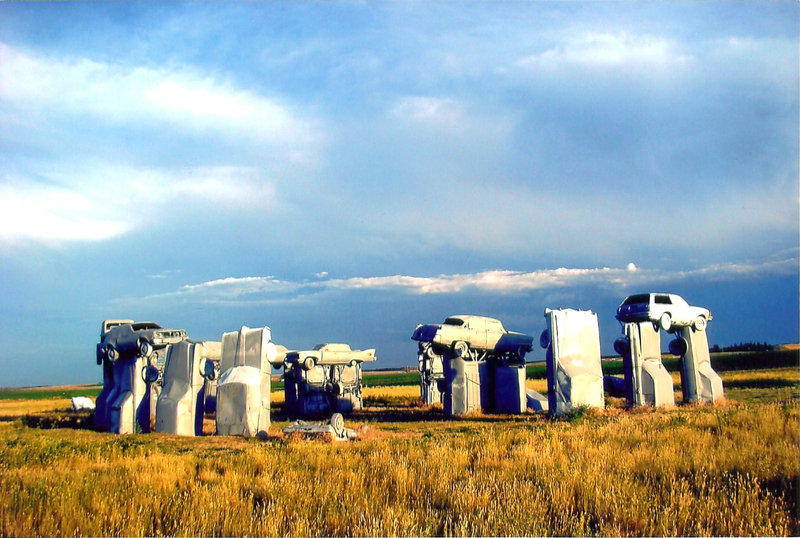 Find the next best thing at a kitschy version of Stonehenge outside the town of Alliance, where American-manufactured cars have been lovingly shoved into the dirt to create Carhenge — a site where capitalism, culture, and Cadillacs converge in one memorable family photo op. Over in Hebron, you can sit back and relax on the (alleged) World’s Largest Porch Swing — it’s long enough to seat 18 adults side by side at one time. However, it’s not actually attached to any kind of porch as far as I can tell. If you work up a thirst while you’re swaying on the swing, stick around for August’s Kool-Aid Days festival in Hastings. My favorite thing about this festival (besides the ridiculous amount of sugar water you get to imbibe) is the boat race. You can build your own ship out of Kool-Aid Jammers packets and Bursts bottles and compete for a chance to take home the grand prize — a pair of Nike Air Force Ones with the Kool-Aid Man emblazoned on the front. What else can you expect in the birthplace of Kool-Aid? At the Hastings Museum, you can learn all about its juicy history and glimpse the original Kool-Aid Man’s costume in all its wall-busting glory — Oh, Yeah! Got more Nebraska nuggets? Send them our way. And stay tuned for more of our funky finds. And if you're on your own Strange Planet, let us know your favorite odd spots, and we'll try to feature them in future posts.